I get this question almost daily, and I am pretty sure I have said this various times, but just in case it wasn’t clear I figured I would share the answer to the question whether a device should be used in a vSAN cluster when it is not listed on the vSAN Compatibility Guide? if you have not looked at the components variant of the VCG for vSAN please take a look here: http://vmwa.re/vsanhclc. Of course, we also have an easier route, which is the ReadyNode VCG. But some may want to tweak based on performance, cost etc. I get that, and so does VMware, that is why we have listed all supported and tested components. Can you use a device which is not listed? Sure you can. Will VMware support the environment? Maybe they will, maybe they won’t! Should you use a device which is not listed if the previous answer is maybe? No! Device X is listed with Firmware version Y, but the OEM says I should use Z, what to do? Ask the OEM why the version is not listed on VMware’s VCG website. Vendors are responsible for certifying components and the software (drivers / firmware) associated with it. If it is not listed then it has either not been submitted yet, it has not been tested, or it has not passed the test. Please only use tested and listed versions, the only exception is when both VMware GSS and the OEM points you to a new version. I had a comment on one of my 2-node vSAN cluster articles that there was an issue with HA when disabling the Isolation Response. The isolation response is not required for 2-node as it is impossible to properly detect an isolation event and vSAN has a mechanism to do exactly what the Isolation Response does: kill the VMs when they are useless. The error witnessed was “This host has no isolation addresses defined as required by vSphere HA” as shown also in the screenshot below. Make sure you have a gateway on the management vmkernel, if that is not the case you could set das.isolationaddress and simply set it to 127.0.0.1 to prevent the error from popping up. Hope this helps those hitting this error message. I had a customer asking about an error they received after upgrading to 6.7 U1. The message they saw was the following: “Unexpected VMware Update Manager (VUM) baseline creation failure. Please check vSAN and VUM logs for details.” I had seen some folks on VMTN also complaining about this a couple weeks ago, and I knew a KB article was in the makings. Just to ensure people know where to get it, and to make it easier for myself to find it I want to share KB 60380 with you. I am not going to copy/paste the resolution, as I prefer to have the KB being leading on this, just in case it gets updated. I don’t want to provide potentially outdated info. So just go to KB 60380 if you are hitting the “Unexpected VMware Update Manager (VUM) baseline creation failure. Please check vSAN and VUM logs for details.” error. Free vSAN 6.7 U1 Deep Dive ebook? Follow @VMwarevSAN closely! 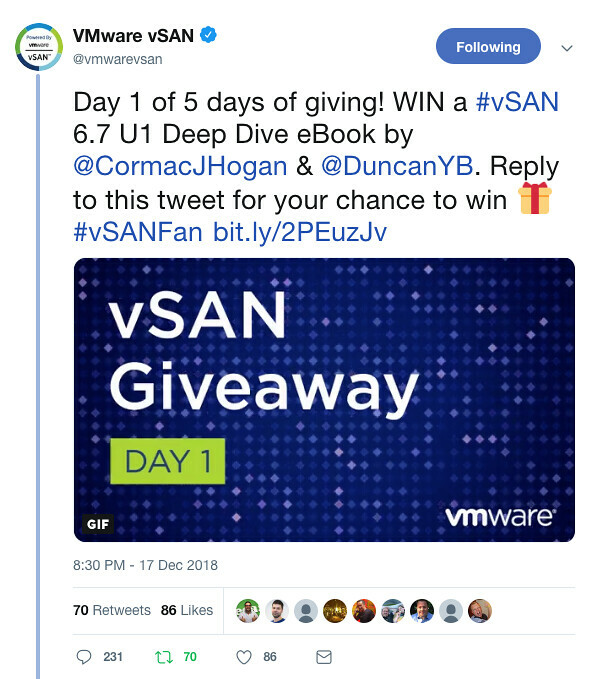 The upcoming 5 days the @VMwarevSAN twitter account will be giving away the vSAN 6.7 U1 Deep Dive book for free. Make sure to follow the account and reply to their tweets, I think around 250 books will be given away, so chances are you will be one of those lucky 250! In the above example, I am looking for the identifier of Outlook, but this could be “Spotify” or anything else as well of course. Figured I would share this, as I found myself searching for half an hour. Note that you need to close/open the app after making the change!